Time of day chickens are active: When are chickens active day or night? Since chickens are nearly blind in low light and dark conditions, day time is their active time. Exceptions to this would be the presence of artificial lighting at night or parts of the world where it doesn’t get dark every night or light every day. It’s the nature of chickens to fly up to a high and safe roost for the night, as day light comes to an end. This high perch helps keep them safe from night predators that roam the ground below. Roosters do seem to begin crowing before first light, sometimes in the middle of the night, but hens and roosters tend to stay put in their roosts until the danger of night time predators has passed and they can see well. Another element that can effect chicken activity is temperature. All domesticated chicken breeds seem to have a common ancestor in the Jungle Fowl of India. India’s tropical climate provides much warmth all year. Many domesticated breeds have been developed to do well in cold temperatures, but on very cold days chickens might prefer to hunker down inside for most of the day. Sunshine and warm weather bring their activities to a peak, resting in a nice shady spot mid day, after a good breakfast and some exercise. Chicken hearing: We have five hens with one cockerel and another four cockerels who live a quiet life in there own pen with no women hens to bother them. Anyway the question I wish to ask is how good is the hearing of chicken. Each gang is allowed out to roam our garden separately each day and whilst digging I am always amazed how accurate and the interest they show in certain patches as I dig. It sometimes seems they can either hear or smell the area were the worms are. Had our girls and boys for about 2 years and they are better than any UN or other body who help and mediate. Our neighbors are very interested in the flock, commenting on many stories they all seem to have of there younger days. I enjoy reading your site thanks for your time. Chickens generally have excellent hearing and vision; sense of smell not so great. I’m always amazed at all the little things chickens peck through the dirt for and eat, when I can’t see what they are so interested in. I’m sure, being so close the ground, they are able to see slight movements in the earth from worms and bugs below the surface. I’m amused that you keep a group of bachelor roosters with no hens to bother them. I’ve always seen it the other way around! Sounds like you have a nice set up that you, your chickens and neighbors can enjoy. Thanks for your question. I have a pair of Japanese quail and the male now has bald patches on his back and head. They are in an outside aviary and there is a chance of them getting attacked by rats. The male protects the nest when I go near. Any Information would be very helpful. I’ve kept Japanese quail and it was usually the hens that got plucked during the overzealous mating practices of the little males. It’s possible the female doesn’t like him or another male bird of some kind in the aviary sees him as competition. I’m wondering if you’re certain you have a true pair. I’ve found these quail highly competitive and aggressive, especially in a confined setting. I would suggest spending some time watching the quail and any other birds in the aviary to see if you can observe any aggressive behavior. I think if rats were getting to them, they would be in worse shape than a few feathers missing. Since quail are ground dwelling and don’t roost, I would try to rat proof the aviary. Besides harming birds, rats will super multiply with a plentiful food source like bird feed. They bring possible disease, not to mention wasting a lot of good feed. A well fed female rat can have 16 babies at a time and female rats can be ready to breed at 5 weeks of age. I’ve heard if you see one rat, there are probably 100 that you haven’t seen. When hungry, rats will go after anything they can grab, including birds and eggs. Live trapping rats in the aviary is much safer than poisons of any kind. But eliminating as many as possible will help keep their numbers down and is important for bird health and safety. Can a chicken break it's own neck: This morning I found one of my Rhode Island Reds dead inside the coop. We have 4 Reds, in a coop about 4x4x3high. They must have been startled by our dogs barking. I let the dogs out at 7:30 am and I let the chicken out at 8:30am. I found her just laying on her back dead. Her neck felt broken and her belly was still warm. No feathers were missing, no cuts, no blood, no animals got in, the other birds came right out of the coop to eat breakfast. She was fine last night. She was the alpha bird in the group, no one picked on her. She was always the first one to charge out the coop door into the pen. Could she break her own neck inside the coop? So sorry this happened to your hen. I’ve never experienced a chicken’s neck broken in the possible situation you describe, but I suppose in a small enclosure and possibly being rushed, or feeling under attack, could cause a chicken to crash into something as she tried to get away. Sometimes under severe panic a chicken’s heart can give out. Certainly there would be physical signs of attack if something got to her. Your analysis of the scene is probably correct. Again, so sorry for this loss. I was wondering at what part of the day Chickens are most active, when do they sleep and what time do they get up. Because of school I would like to know when to care for my chickens (I don't have them yet). Also, what do you feed chickens and chicks. Please answer ASAP, Thanks a bunch! Chickens are active during daylight hours. They wake at dawn and head for the coop when the sun goes down. Chicks will get chick starter feed for the first 6 weeks. Chicken feeds are designed as complete feeds, meaning they have all the vitamins, minerals, grains and supplements added in the right proportions. You want to buy feed according to what type of chickens you are raising, egg laying or meat. Keep your feeders full at all times. Chickens will eat exactly the amount of feed they need. Every now and then I will give my chickens different treats, be careful and don't over do it. You can find a complete list of treats here: (www.raising-chickens.org/chicken-food.html). And always remember to make sure they have fresh water, chickens can become dehydrated very quickly. 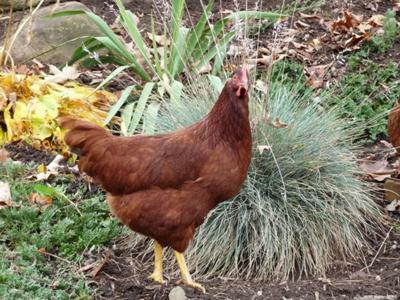 It is ok to let your chickens free range during the day while you are at school. The only thing you need to do is to make sure there will be no chance of predators attacking your chickens. Go to our predators page to find out which predators are in your part of the country.